The terrorists and terrorist nations such as Saudi Arabia only fear one thing: the destruction of the religion of Islam. There is nothing in this life that has greater value to them than Islam. They are willing to sacrifice and even die to promote Islam. This religious motivation is the engine that drives the Jihad against us. What if the Dome Mosque on the Temple site in Jerusalem was blown up? The US government and its allies must agree that this is the final solution to the Muslim problem. We must tell all terrorist groups that the next time they destroy the lives and properties of Americans at home or abroad, we will destroy Mecca, Medina and Dome Mosque. 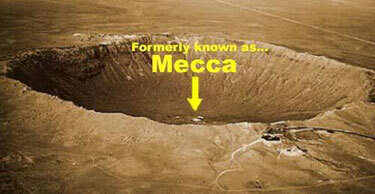 They will be responsible for destroying the three most holy sites in Islam and bringing the religion to its knees. We must tell all the Muslim countries that are presently supporting and harboring terrorists that if they do not cease and desist at once, we will destroy the heart of their religion. Saudi Arabia and the rest of the Islamic world would, for the first time in their bloody history of oppression and tyranny, have to give civil rights and human rights to women and non-Islamic religions. They would have to allow their people to decide for themselves what religion, if any, they want in their lives. The “religious police” would be disbanded. 4 Feedbacks on "A Modest Proposal"
Surely you jest. That just makes too much sense, it would actually work. So it could never be concidered. Do you think we really want to end this or something? Tut tut. I really think that Obama wants to lose this war and destroy the evil, unjust, racist USA. I’m afraid T. Shaw is right. If we’re the racist and unjust nation. Then why are the citizens of every other nation cowtowed before invaders? You’re a shameful cuck and will be known as one till the day you die. Unrespected and unloved by anyone.